Win $35 to Spend at Growing Up Geeky's Etsy Shop Giveaway! 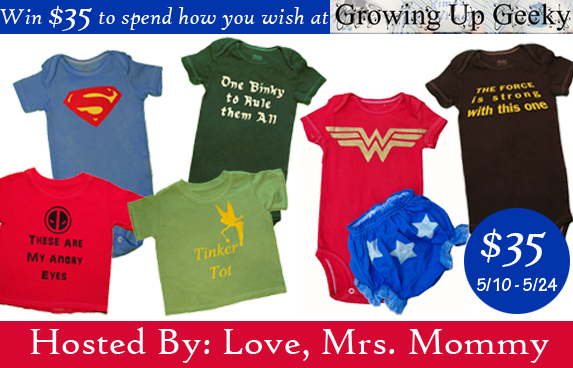 Growing Up Geeky makes adorable, fun, and unique clothing items for your little ones! Be sure to check out Love, Mrs. Mommy's review HERE! Open To US - Must be 18+ to enter Giveaway Dates ~ 5/10 12:01 AM EST through 5/24 11:59 PM EST Good Luck! Disclosure: Love, Mrs. Mommy and all participating bloggers are not held responsible for sponsors who do not fulfill their prize obligations. Love, Mrs. Mommy received the clothing shown in the review at no cost to facilitate the above-mentioned review. This giveaway is in no way endorsed or sponsored by Facebook or any other social media site. The winner will be randomly drawn by Giveaway Tools and will be notified by email. The winner has 48 hours to reply before a new winner will be drawn. If you would like to participate in an event like this please contact LoveMrsMommy (at) gmail (dot) com.